Is he still on tour? Is he alreading doing the work that God assigned him to do? Was he allowed to take a little time to get adjusted to his new home? He didn't need to heal from his injuries, rest from being tired, grieve that he had died, so what is he doing? I hope he and his grandad are spending time with some horses. They won't need the vet or vet supplies to care for sick or injured horses. Here their horses weren't always allowed to be horses. They couldn't ride them in the pasture--afraid they would step in a hole or something. So they rode them in arenas on prepared soil. I bet they don't have to worry about holes up there. I slept until 6:00 this morning and only woke up once around 3:00. It was the longest I have slept in two weeks. That is typical of a normal night for me, so I thank all of you who have been praying for my sleep. It is working. 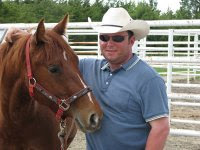 I have been thinking how much horses were a part of Jason's life from the time he was a little guy. I've told this story over the years, so if you've heard it, bear with me. Jason was five when Allison was born; in April before Allison was born in July, Pepper, his first horse, had a colt. We happened to be there when the colt was born and have pictures of all three of them in the pen. Pepper was a small pony, so Jason wasn't much taller than the new colt. I knew then that I was really going to have a special baby to compete with this new colt. Luckily Jason was a doting big brother from the first day. He was that way with Carson too seven years later. I have so many images of Jason, the big brother, playing with Allison and Carson when they were babies. He could always make them laugh. So many people have told me how much their children loved Jason--it was because when kids were around, Jason didn't ignore them. He played with them and ignored the adults. Now for the story--when I was expecting Allison, Jason and I commuted from Wellston to Stroud. On the way home one afternoon, he said, "Mama, who are you bred to?" After I regained my composure, I said, "Well, Jason this baby will be a full brother or full sister to you." Without pause he said, "Oh, Dad." His horse sense came early to him. When I read these blogs its just like your sitting here telling me in person. I laughed so hard in the blog where you were talking about your mom and pickled okra. Keep it up.